What do an amnesiac in a cat costume, a reporter for a gossip rag, an up-and-coming detective, a reformed street punk that loves keeping his city clean, and a virus researcher have in common? They’re all the protagonists that share a combined fate for what will happen to the city they love in 428: Shibuya Scramble. 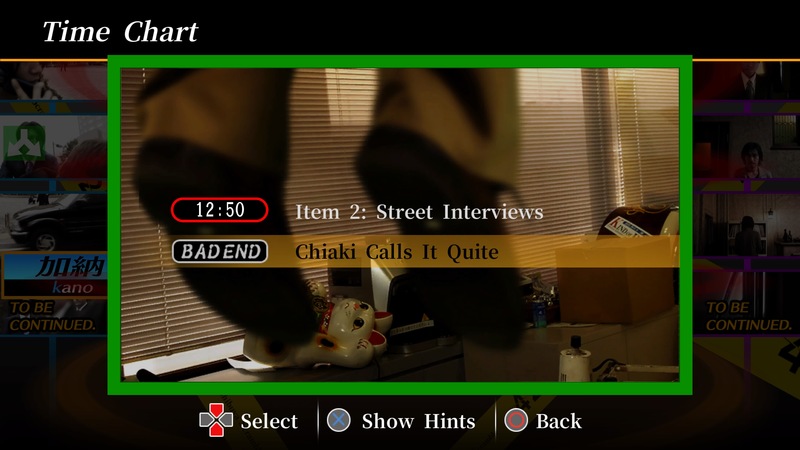 From the brain trust at Spike Chunsoft, this new take on a sound novel (not to be confused with a visual novel) employs real-life actors to portray a larger-than-life take on just another ordinary day at Japan’s busiest crossroad. The difference between a sound novel and visual novel is still a distinction that’s lost on me. While a visual novel typically involves characters talking amongst each other in smaller conversation snippets, a sound novel like 428 blankets the scene with an info dump. By the end you’ve seen the true ending to Shibuya Scramble, you’ll feel like you’ve read an entire opus from cover to cover. Everything from minute details to a character’s inner monologue is described in great detail against a backdrop acted out by real people. In a very unique take on the genre, 428: Shibuya Scramble’s main scenario doesn’t contain a single scene that lacks a real person or photograph to set the stage. Just because 428 isn’t animated doesn’t mean that the narrative can’t approach the level of cartoony antics. In between the moments of kidnappings and hostage negotiations are some genuinely well-written antics about fleecing the rubes and hocking phony health products. 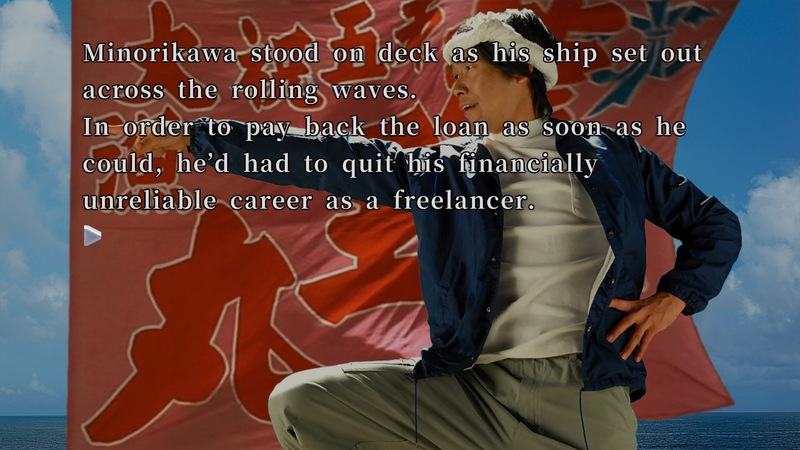 The first half of Tama’s scenario essentially revolves around working together with a perpetual conman named Mr. Yanagishita that’s always looking for the next get-rich-quick scheme. Of course, these rarely turn out well, but who knew there would be such a market for diet drinks that make you just sweat off the pounds? 428: Shibuya Scramble’s story chapters are all split up into self-contained hour blocks that must see every protagonist make it through alive before the next chapter is unlocked. Along the way, players will be subjected to bomb threats, kidnapping, gang fights, angry soon-to-be-father-in-law’s and all manner of denizens who trawl through Japan’s most infamous intersection. 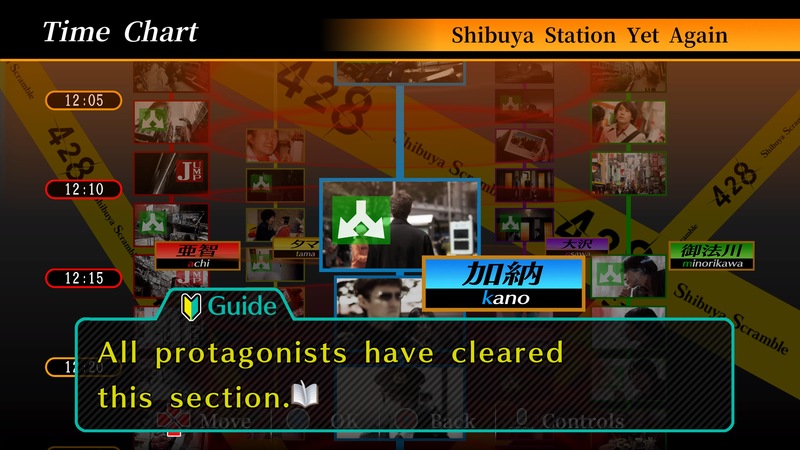 With eighty-some bad endings preventing you from making it through to sundown, 428: Shibuya Scramble routinely has roadblocks that players must circumvent to make it through the thoroughfare. Tasks that occur in one character’s chapter will directly link into another and on occasion, jumping between the two moments in time will be required to make it through the final stretches of daylight. It’s incredible to see the framework behind 428 in motion and to see just how intricately woven together these five various viewpoints routinely come together, even if just in passing for a brief moment throughout the day. 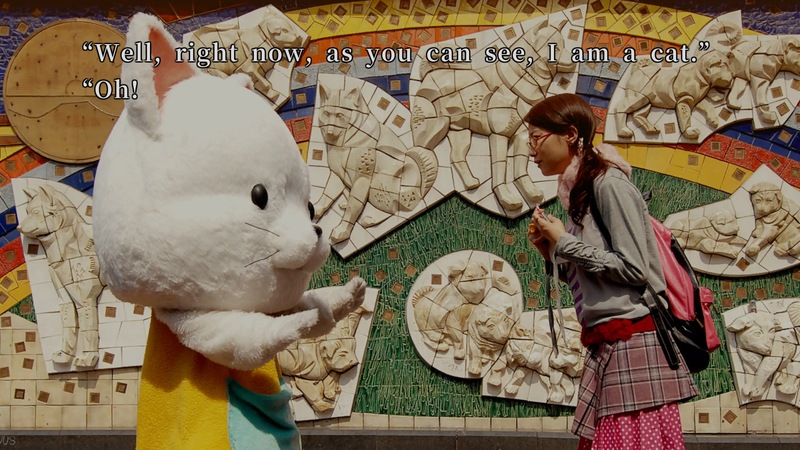 Underneath the trappings of a sound novel, 428: Shibuya Scramble hides a delicate puzzle to solve, one hour at a time. Some of the pieces are quite obvious to the player, such as hints that indicate a necessary jump into another protagonist’s timeline when their name appears in red. These jumps are the only way to re-enter a scene that’s been locked out and sometimes aren’t the most obvious of choices. Sometimes, the right move to progress is to jump into a character’s timeline many minutes in the past. The other aspect of gameplay in 428: Shibuya Scramble comes in the heat of the moment choices players will have to make. No, Spike Chunsoft hasn’t reinvented the genre by adding Quick Time Events to their sound novel. These all-important choices take the wait of multiple-choice options that can immediately impact other characters’ scenarios and lock them into an all-too-common Bad End. You’re able to freely jump back to any moment in the chapter and previously selected choices will be color-coded, allowing you an easier time to change your fate even if for a brief few minutes. Being that 428: Shibuya Scramble is a sound novel, there’s a lot of text to go through. Repeat playthroughs will have you re-reading the same texts over and over until you either reach a branching path or option to jump to another protagonist’s perspective. The final chapter of 428 is especially notorious for this, as it boasts the highest number of bad endings that the player will inevitably stumble upon as they search down the one true path that stands out amongst all of the false ends. There is an option to fast forward the text as a brisk pace, but nothing that comes close to the instantaneous text skip of a visual novel like Muv-Luv that zooms you straight to the next choice. I could understand this for similar paths that have largely the same text between one another, but when you’re searching for that one minute change that can lead to another outcome, scrolling through page after page lessens the emotional impact. Even after the kidnapping is resolved and Shibuya’s streets last to see another sunrise, 428: Shibuya Scramble is still packed with an insane amount of post-game content. Two scenarios are available right from the start, one involving Achi’s sickly sister and the other explaining the origins of Maria’s mysterious friend, Canaan. The latter is especially unique, as not only does it feature the only bit of voice acting in 428, but it’s also completely animated by the same studio most recently known for their anime adaptations of Fate/Stay Night. Each of these scenarios adds in a couple of hours of light novel reading. But, 428 doesn’t just end there and wrap up the package. By answering a brief dozen-question quiz game, even more, story vignettes are unlocked featuring the various side characters that make a brief appearance in 428: Shibuya Scramble. These are much shorter than any of the other scenarios, often a few minutes long a piece, but each help brings more life to the cast that barely gets any screen time alongside the various protagonists. As an added bonus, at the end of each mini-scenario is a hint about one very specific scene in the story. When you return to that moment in the story, you might stick around long enough to notice the screen to slowly pan to one side, revealing a secret code to input. These, in turn, lead to MORE scenarios, and possibly even a true final ending if you’re diligent enough. From beginning to end, 428: Shibuya Scramble pulls no punches and delivers one of the most content-rich sound novels to grace a console. What begins as just any other day in Shibuya ends with a bomb threat and the potential for a virus outbreak with a near-100% mortality rate. Despite these harrowing tales, Spike Chunsoft has balanced the narrative with equal parts slapstick humor to create a reading experience unlike anything else on PlayStation 4. 428: Shibuya Scramble might not feature any action, but the story will keep you on the edge of your seat until the very end. Never before have I played an interactive novel that kept me so compelled to the very end, and once it was wrapped up all neatly, 428: Shibuya Scramble continued to surprise me with more and more story than I could've ever asked for.